“You’re living my dream!” is the reaction we get most often, whenever we meet people and tell them that we live, work and travel from the road full-time in our RV. 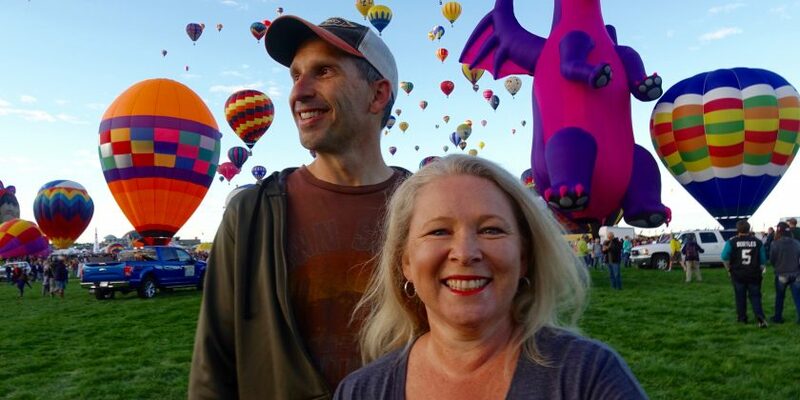 It’s uncommon to come across a couple in their 40s who are still working full-time, to be living a nomadic and adventurous life full time in an RV, but for us, it’s become our new normal. 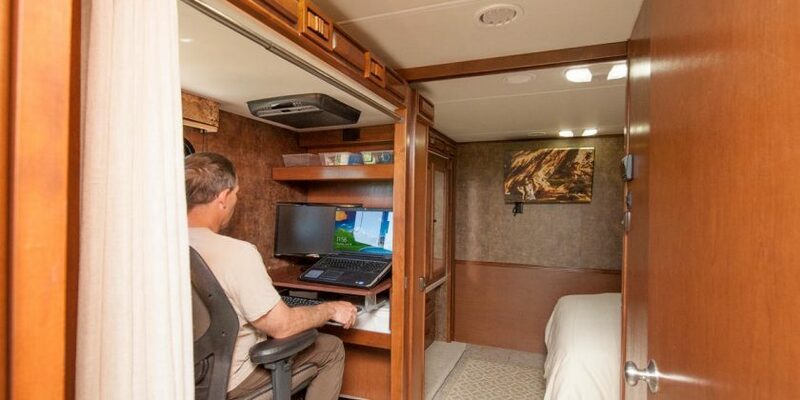 Full-time RVing is no longer the domain of retirees, it’s becoming much more common for couples, families and solo RVers across every age group to embrace RVing as a lifestyle. Advancements in technology and cellular connectivity, is making remote work much more viable for working age people, like us. Our journey began back in June 2014, when we waved goodbye to family, friends, and our Colorado townhouse to live a life of freedom on the road. Since then, we have visited all 50 USA states while still working full-time. We have visited more than half of the 59 national parks, summered in Maine, wintered in Arizona, hiked Colorado’s Rocky Mountains, snorkeled in the Florida Keys, driven into Canada and walked across the border into Mexico. We even spent a month in Australia, working in opposite time zones, back in 2016. It’s not like we started out with a bucket list to be checked off or a list of places we wanted to visit. We just chose to travel to wherever we wanted to go, followed the good weather, stayed as long as we wanted to stay, and kept on moving. Almost five years later, we’ve driven over 35,000 miles in our RV and about the same again in our tow vehicle. “We call our life a never-ending road trip” jokes Marc. The idea of living in an RV first crossed our minds in 2011 when we met a full-time RVing couple sitting at the table next to us at a restaurant in Colorado Springs. But we never really thought about it seriously at the time – we were about to get married and had full time jobs and commutes that kept us busy. It wasn’t until late 2013 when we started thinking about what we wanted in the year ahead – more travel. We didn’t want to wait until retirement and we wanted to be able to travel with our labradoodle, Coda. That was when we remembered our encounter with that full-time RVing couple and began exploring the viability of the RV lifestyle. It required some creative thinking but we figured out a way to make it work and realized it could actually be more cost effective than our regular life in Colorado. Marc was already working remotely as Operations Manager for a Texas-based company, so as long as he had reliable internet, he knew he could still do his job effectively. However, Julie was in between jobs and saw this as an opportunity to reinvent herself while getting back to self employment, through writing and making videos for our RVLove blog and YouTube channel. We actually drive a lot fewer miles than most people think while packing in a lot of travel. For example, one year (2015), we started out the year in San Diego and finished up in Miami, exploring from Colorado, Niagara Falls, Maine and everywhere in between. We finished up that year driving 8,408 miles in the RV, and little over 11,000 miles in our tow vehicle, while visiting 33 states! It’s amazing how much more travel you can fit into your everyday life when you’re living in an RV. We’re not spending time commuting, or traveling to and from vacation destinations. We simply make our way to places – like the Grand Canyon for example – and stay in the area for a week or more, to explore locally, which we can do after hours and on weekends. After about 3.5 years on the road, Marc quit his job and we built an online school for wannabe RVers “RV Success School” that takes people through the process of what they need to learn and understand to make the best decisions for their RV and lifestyle. A few months later we were cast to appear in a movie about the full-time RV movement called RV Nomads (which premiered in October 2018). If that wasn’t enough of a whirlwind of a year, in January 2018, a major publisher came knocking on our door and asked us to write the “bible for the RV lifestyle”. 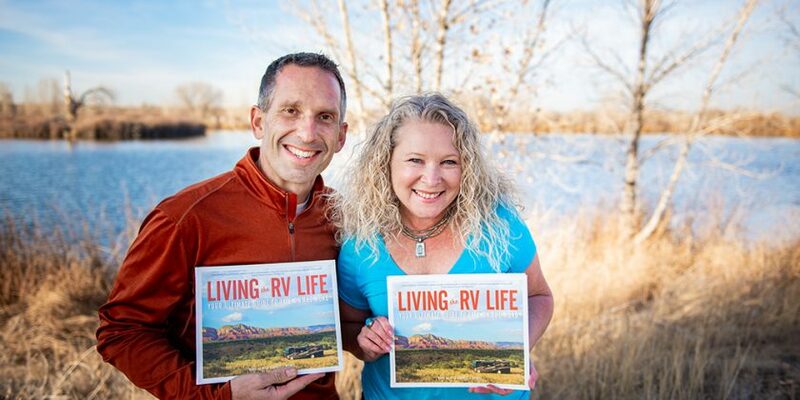 We got to work right away and our book “Living the RV Life – Your Ultimate Guide to Life on the Road” was published on November 20, 2018 by Adams Media, a division of Simon and Schuster. “Living the RV Life” is 256 pages, a full-color coffee-table style book, jam-packed with practical information, gorgeous photography, and guidance to help people understand the RV lifestyle, the different kinds of RVs, and takes them through all of the important things they need to understand before making all the decisions related to such a big life change. “Living the RV Life – Your Ultimate Guide to Life on the Road” is available at all good bookstores, online at Amazon.com, Barnes & Noble, and even in some Costco warehouse locations. They are best known for their positive attitudes and practical advice, as shared in their YouTube videos and blog posts at their website RVLove.com. Their mission is to empower, entertain and educate others considering living the RV life, to help them hit the road and thrive too.